one of my favorite books is a 1000-page tome called curiosities of popular customs, printed in 1897, that i got for a dollar from my high school library. it is an encyclopedia of archaic "rites, ceremonies, observances and miscellaneous antiquities" as the subtitle claims. a "compilation of antiquarian writings" if you will, under headings like "dog-whip day" "corpse-gate" and "wassailing the orchards." if that wasn't enough, the writing-style is all old-fashioned and racist in its’ descriptions of non-anglo-saxon rituals. 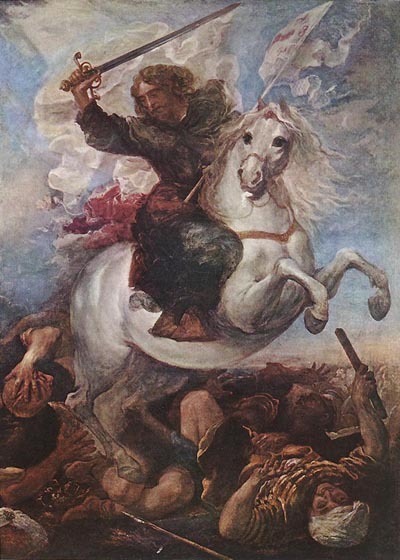 "numerous miracles had already been performed at [st. james'] shrine, which were capped by the appearance of st. james himself at the battle of clavijo in 841, where he killed single-handed sixty thousand moors..."
"...though the spanish body of st. james has disappeared, there are many other bodies of the saint preserved in europe. one is claimed to have been brought to toulouse in the fourth century. another body of st. james is said to have been translated into italy...the heads of st. james are very numerous: there is one in toulouse, while two are at venice (one in the church of st. george, another in the monastery of ss. philip and james). there are a skull and a vessel of the saint's blood in the church of the apostles at rome, a head at valencia, another at amalfi, still another at st. vaast in artois, and part of a head at pistoja. bones, hands, and arms of the saint are scattered about in great numbers, and are shown at troyes, in sicily, on the island of capri, at pavia, in bavaria, at liege, at cologne, and in other places. some bones of the saint are shown in the escorial." so for those of you playing the home game that’s like 15 whole bodies for one person. can you imagine the rivalry between those two churches in the same town that both say they've got this guy's head? and the place where one has the whole body and one has just a head. not to mention the "part of a head" people. that must be some item they've got there to even give them the idea to try to pass it off as a saint's in the first place. how impressive does a part-head have to be before people start saying to each other "man, we have got to put this thing on display."